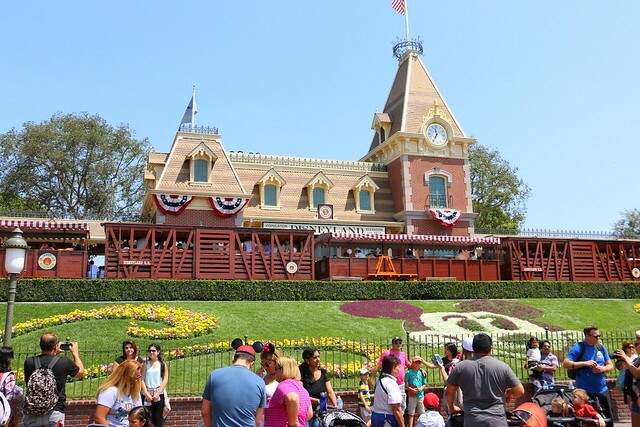 Ahead of the ScareLA convention, I spent a couple days at the Disneyland Resort with the goal of taking in everything new since my last visit. 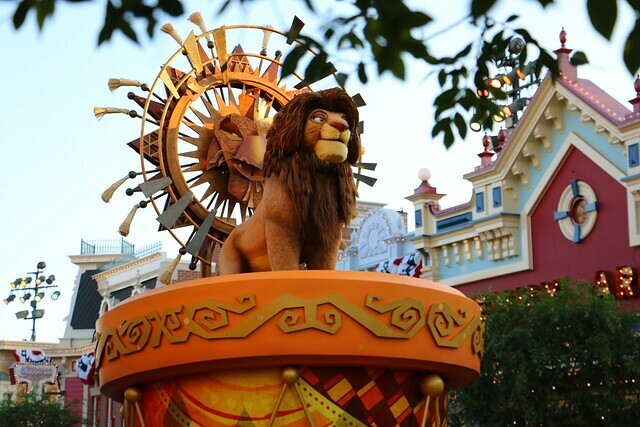 Though I was just there a few months ago, there is already a lot of exciting new additions to the two parks, just in time for a new ParkSpotting adventure. 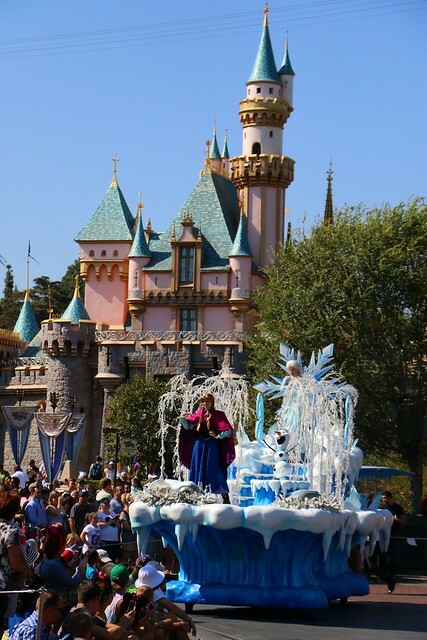 Welcome to Disneyland! Yeah, that’s better. 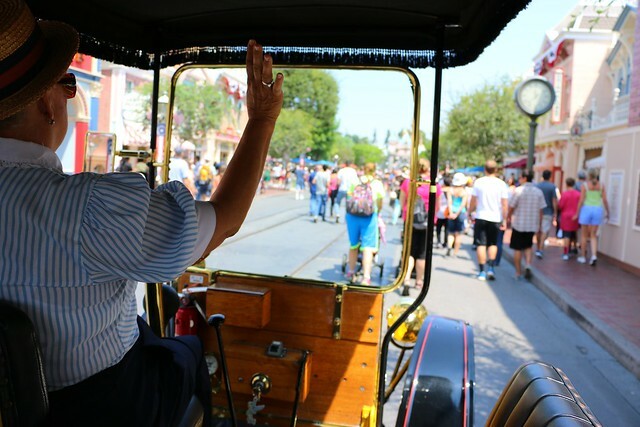 Somehow this was the first time I’d ever ridden this particular Main Street USA vehicle, a great way to begin the day. First stop: Innoventions! Never would have said that before Marvel moved in. 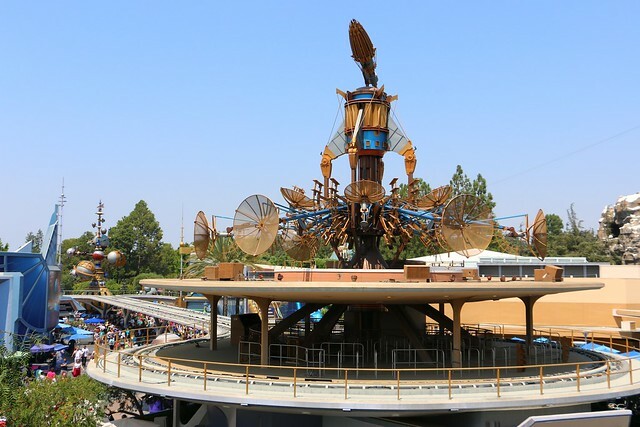 On the way up is a chance to look at the former home of the PeopleMover, an attraction I wish I had the chance to ride. 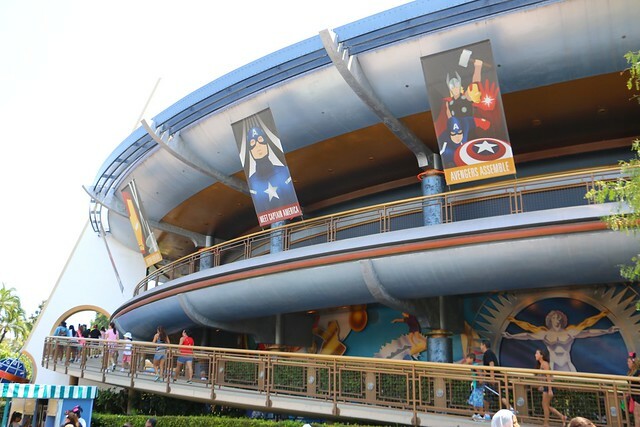 Two goals inside Innoventions: Meet Thor and Captain America. 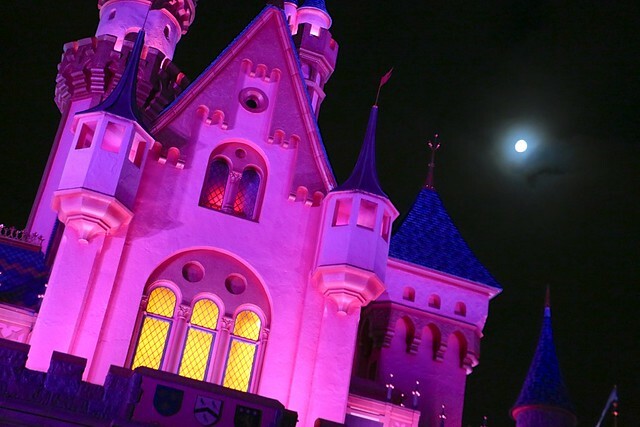 I’d never done either at Disneyland. 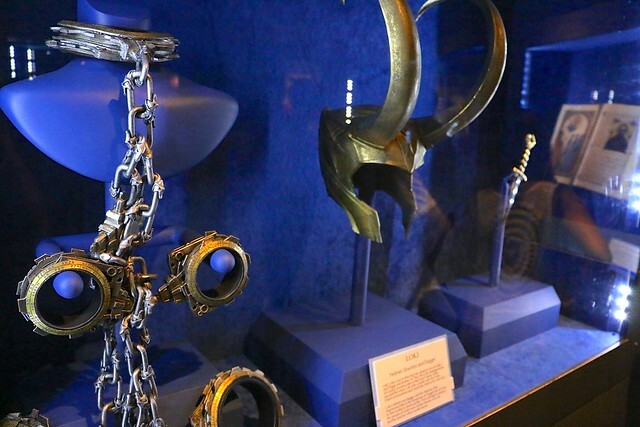 The gallery of Asgardian artifacts was nice, particularly Loki’s helmet. 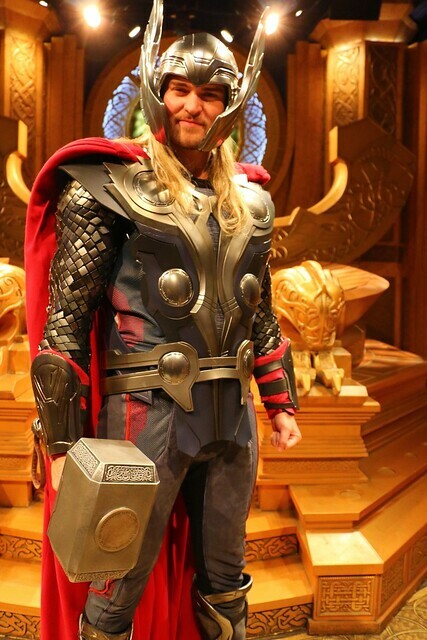 After the quick trip through the bifrost, I was face to face with Thor himself. Nice guy. He let me hold his hammer – though he didn’t let it go completely. It’s a fun mini show. Of particular interest is the snazzy S.H.I.E.L.D. 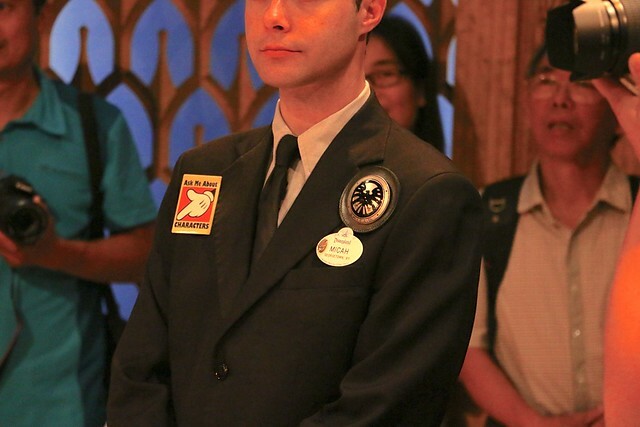 badge the character attendants wear. 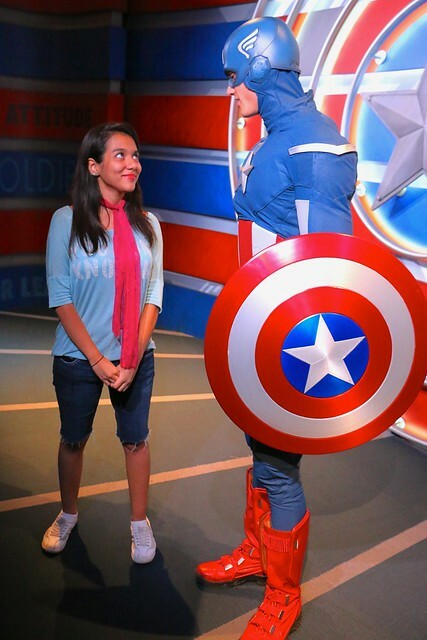 Cap is a hero often looked up to. Literally. He’s a tall guy. 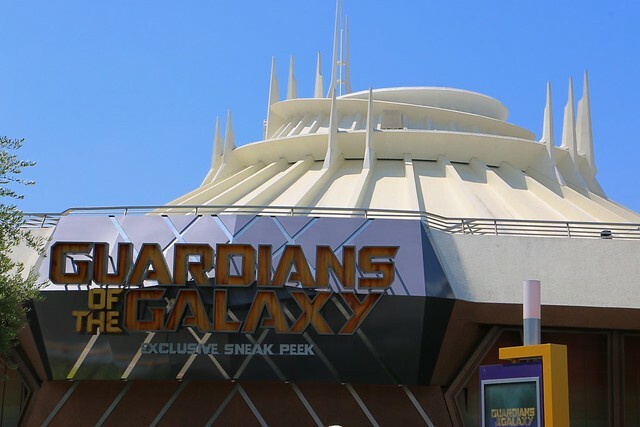 The meet-and-greets are a blast, but there’s even more Marvel in Tomorrowland now with a Guardians of the Galaxy 4D experience that’s completely fun. I wish I could see the whole movie like that. 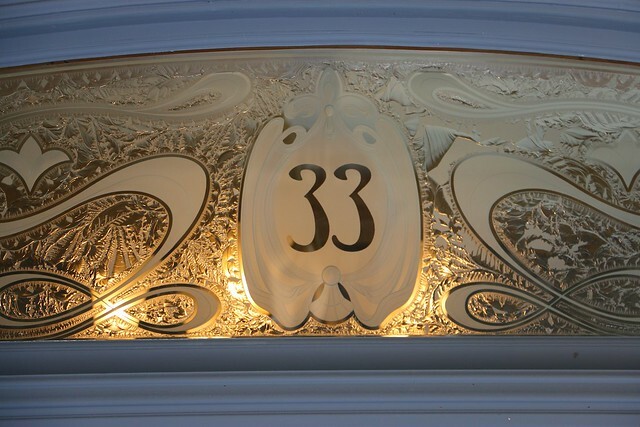 I dined at the newly updated Club 33. Read all about that experience by clicking the image above. 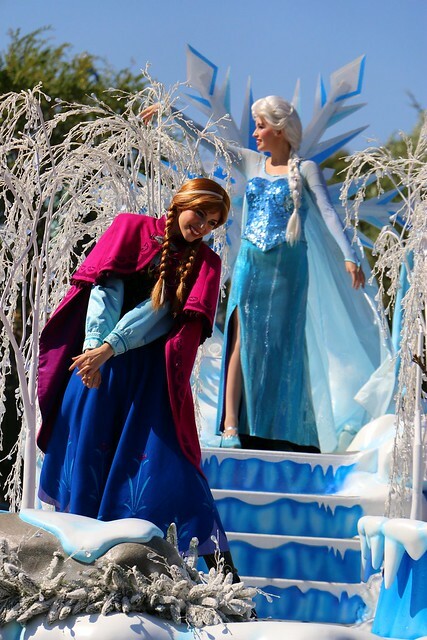 The park’s new Frozen pre-parade draws quite a crowd to see Anna and Elsa. The pair of sisters looked great, as always. 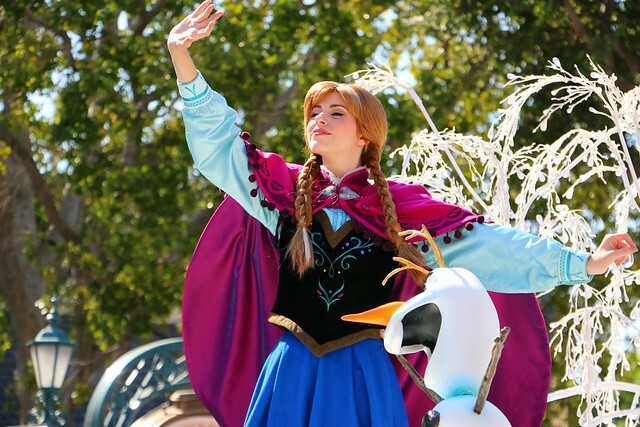 Anna did her best to not look too goofy. 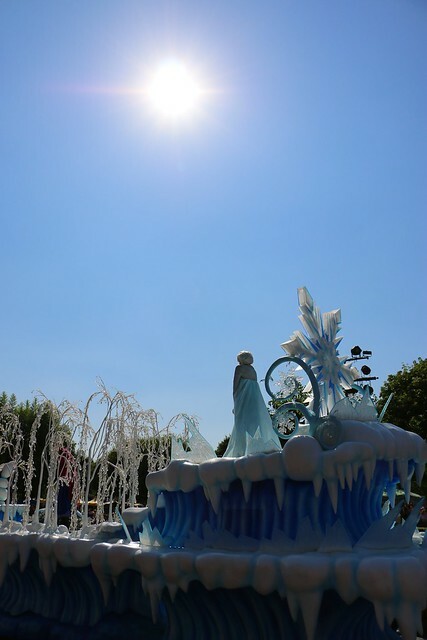 Elsa did a great job keeping Olaf from melting while he enjoyed the summer sun above. 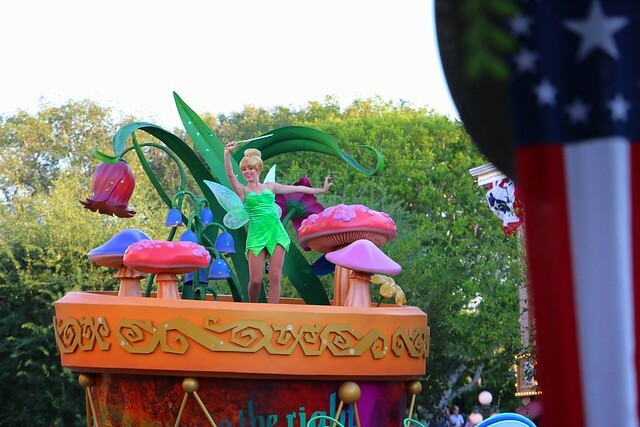 Mickey’s Soundsational Parade is still my favorite of all of Disney’s daytime parades. 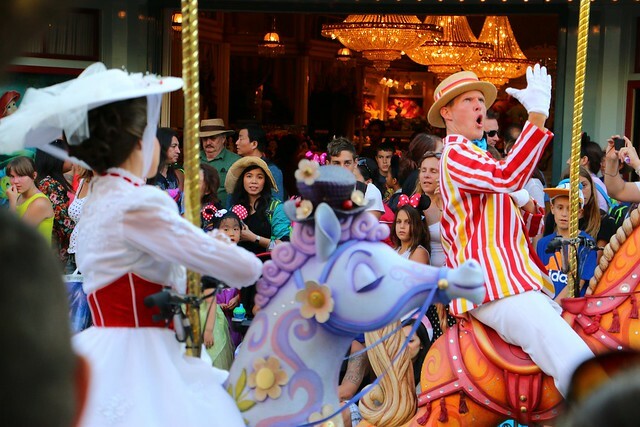 Florida’s Festival of Fantasy is nice, but Soundsational has such an amazing soundtrack. 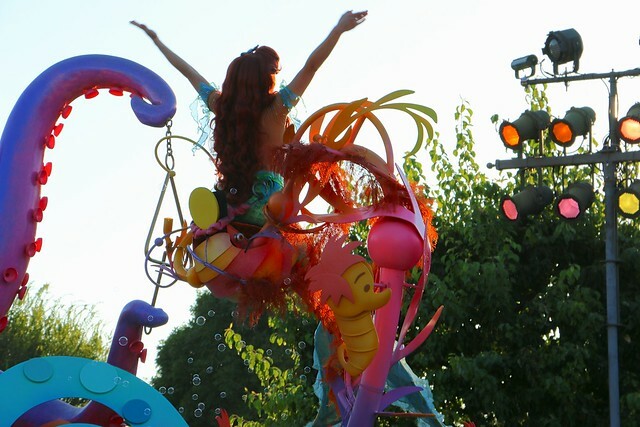 The whole look of Soundsational flows so well across all its floats. Clearly Bert is pretty excited about it too. 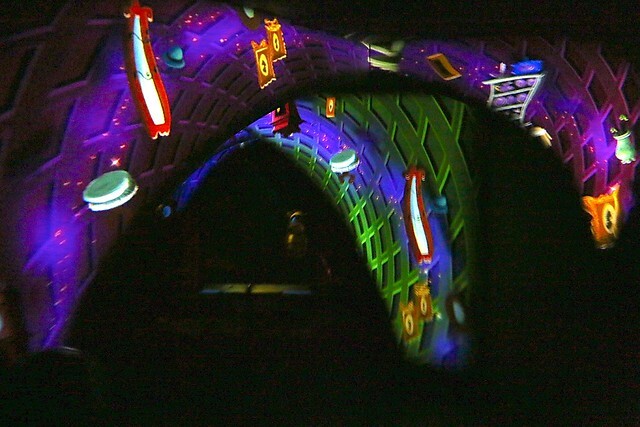 Two new interactive experiences recently debuted at Disneyland, both new to me. 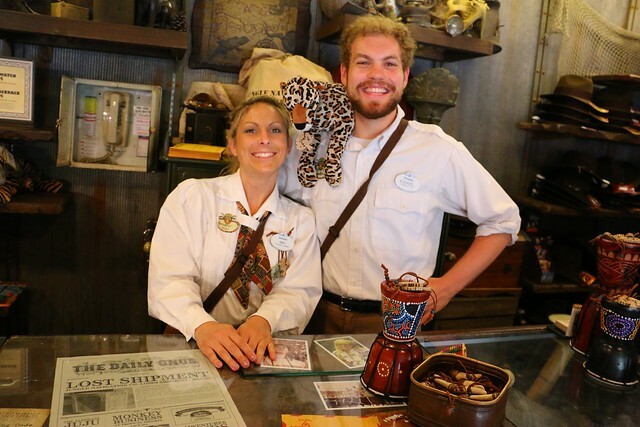 The Adventureland Trading Company is tons of fun. Read all about it by clicking the photo above. 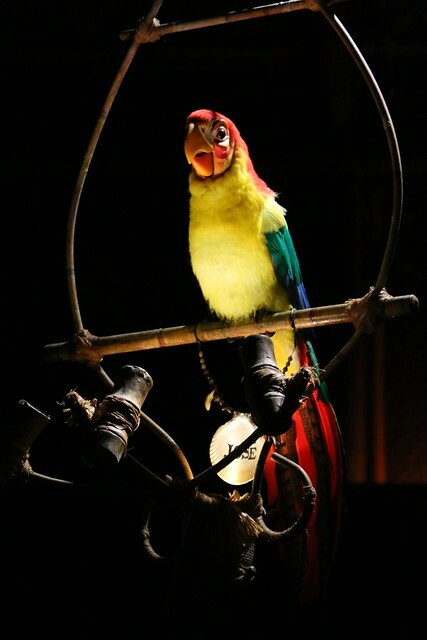 As part of the Adventureland Trading Company experience, I visited the Enchanted Tiki Room, enjoying the outdoor pre-show first. 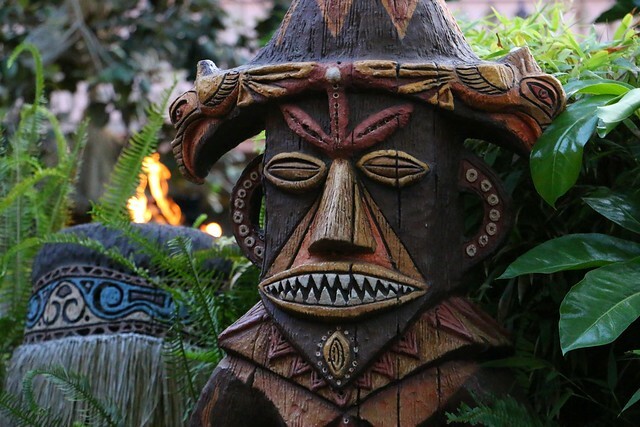 The Tiki Room is always a treat, especially now that it’s part of a special Adventureland photography task – perfect for me! 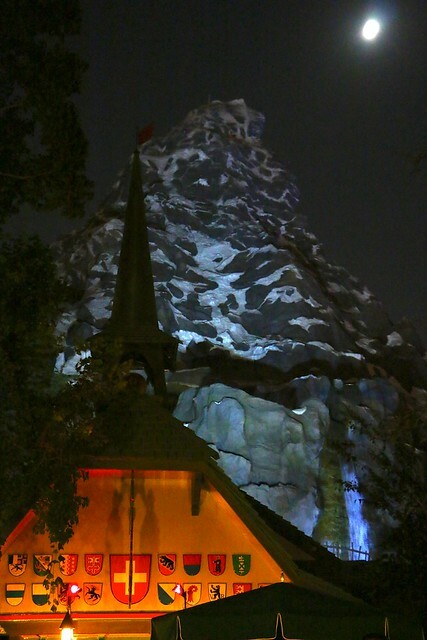 While hunting around in Adventureland, it’s always a good idea to go for a ride on the Indiana Jones Adventure, which recently received some projection upgrades in the opening Mara scenes. 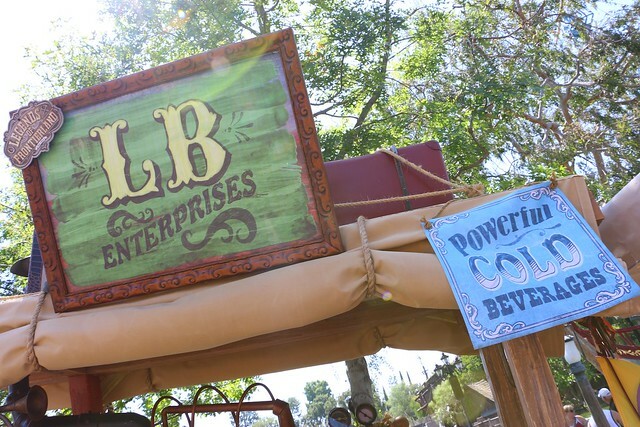 While the Adventureland Trading Company features fun in small bursts, the Legends of Frontierland experience features non-stop interactions with clever characters throughout the land. 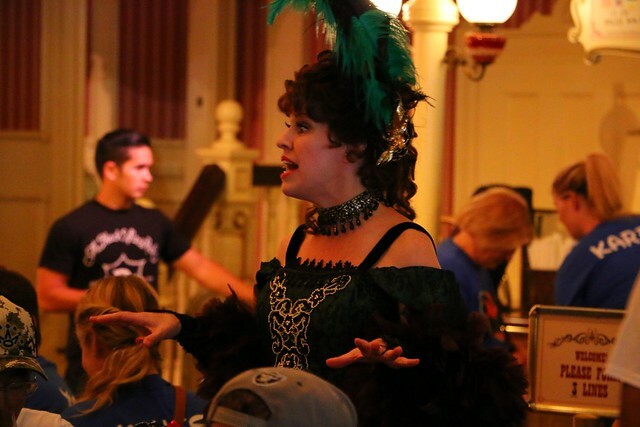 The indoor show at the Golden Horseshoe is nice, but the real guts of the experience is outside. 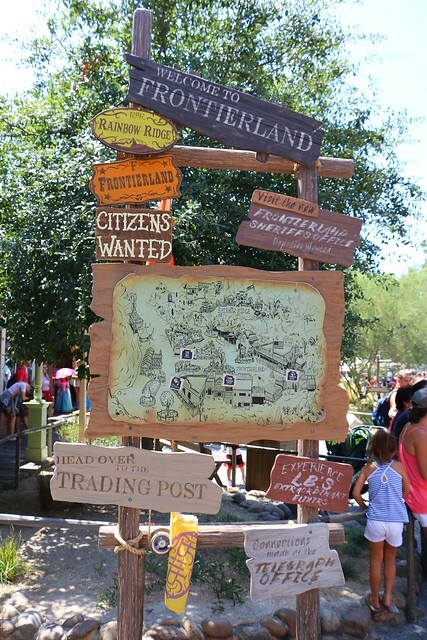 At first, the Frontierland experience doesn’t make a whole lot of sense, as very little guidance is given. 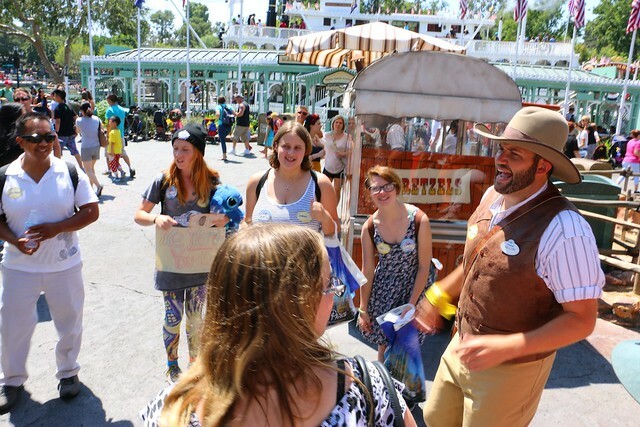 I was given the name Gecko Cooper to participate and sent on my way, eventually stumbling across Willum who helped explain that us Rainbow Ridgers were trying to buy up more land than the fellows from Frontierland. 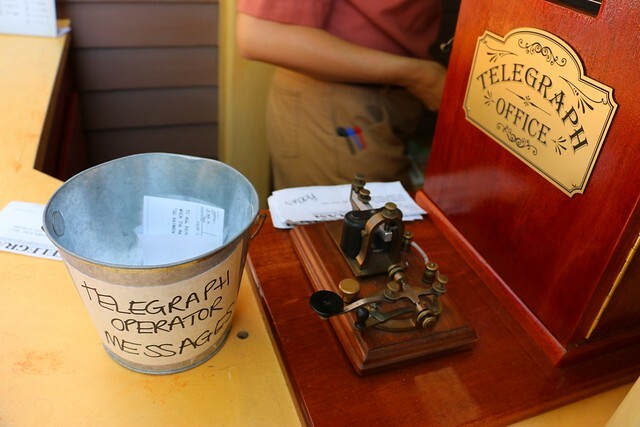 Bits and gold could be earned through odd jobs, like delivering telegraphs. Once you get the hang of it, it’s a pretty neat adventure, really feeling like you accomplish jobs in the old west alongside plenty of crazy characters. 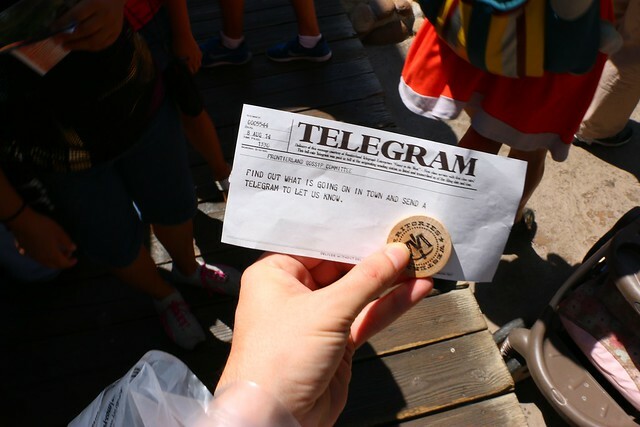 Handwritten notes even print out as formal telegrams to be delivered. Thankfully, I was never jailed. 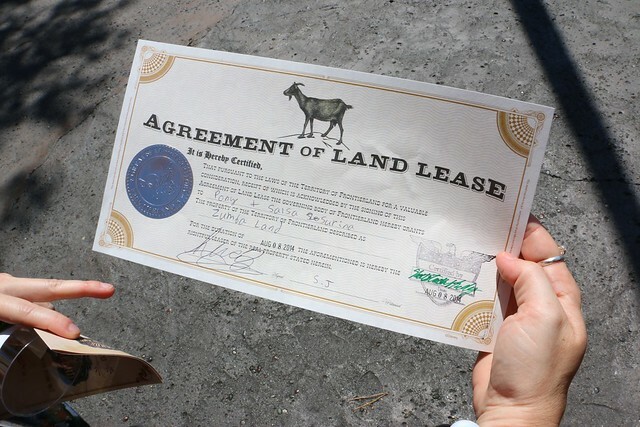 But I did earn enough bits to buy some land. 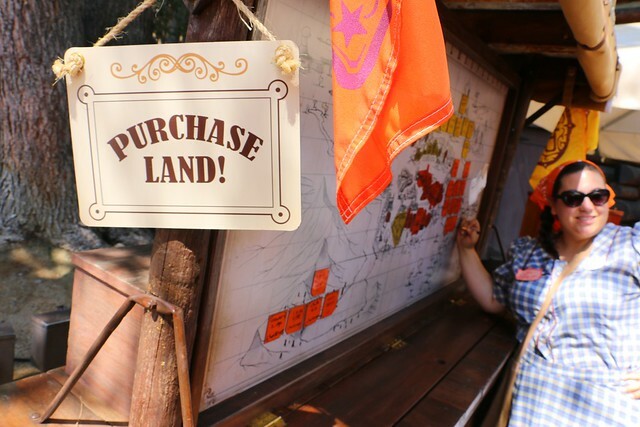 Whichever team – Rainbow Ridge or Frontierland – has the most land purchases at the end of the day wins the game. A few elixirs can come in handy to make earning money a little easier. 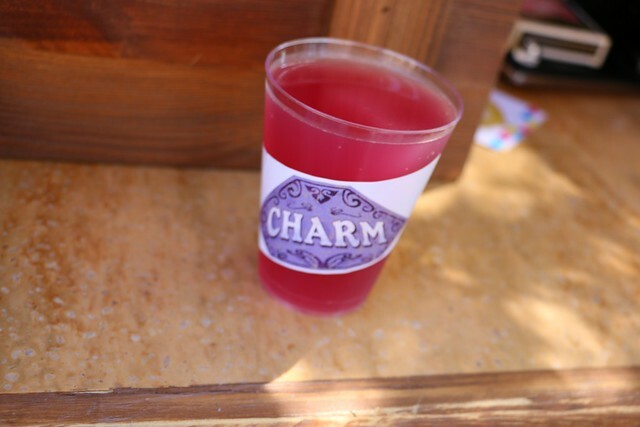 This Charm drink ($3) worked wonders, causing a few of the characters to feel rather generous. One even gave me a gold nugget worth 50 bits! But after an hour and a half of playing in the hot sun, I tapped out of the experience. It’s fun – but not THAT fun. I never did find out if my team won for the day. 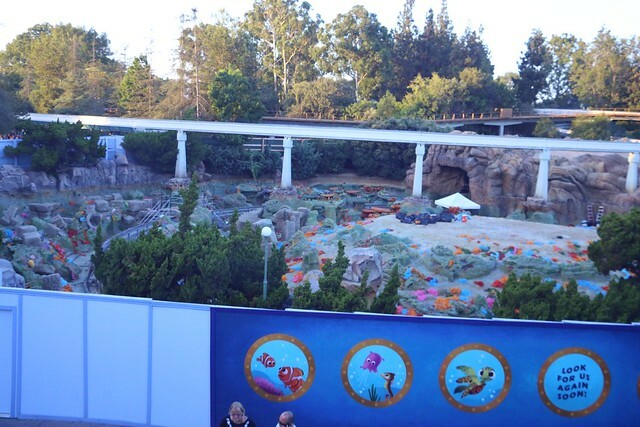 Back in Tomorrowland, the Finding Nemo Submarine Voyage continues to receive a major refurbishment – its first since its grand opening. 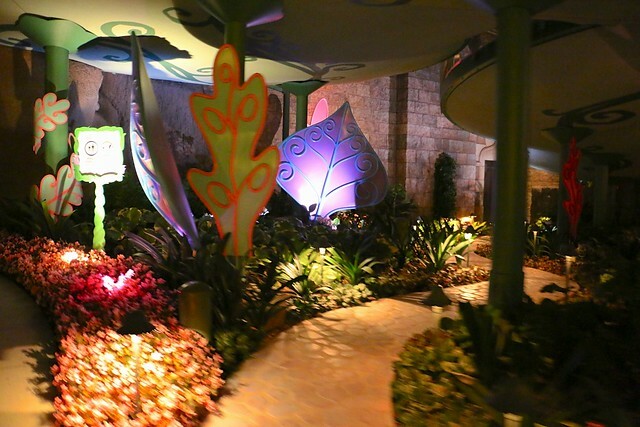 The lagoon is drained, offering a unique look at its colorful coral. 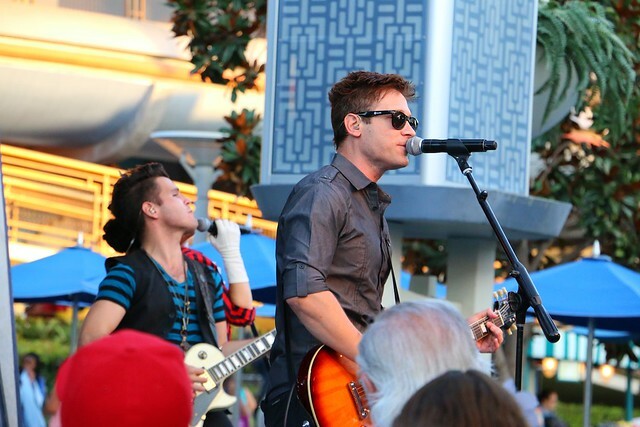 Live bands regularly rock Tomorrowland too. 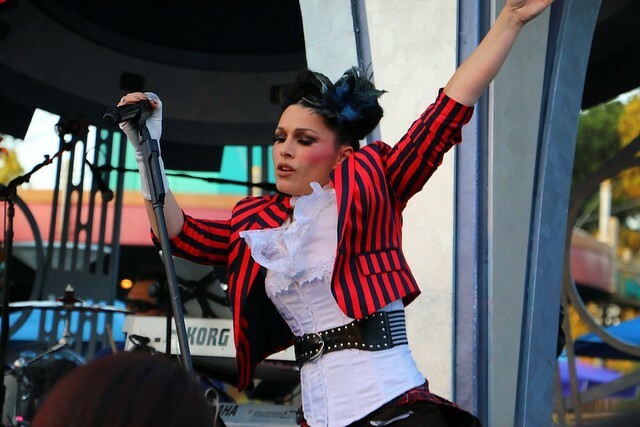 They’re all actually pretty good – and aren’t theme park bands. Real acts play real music, even if it doesn’t fit the area. And it works. 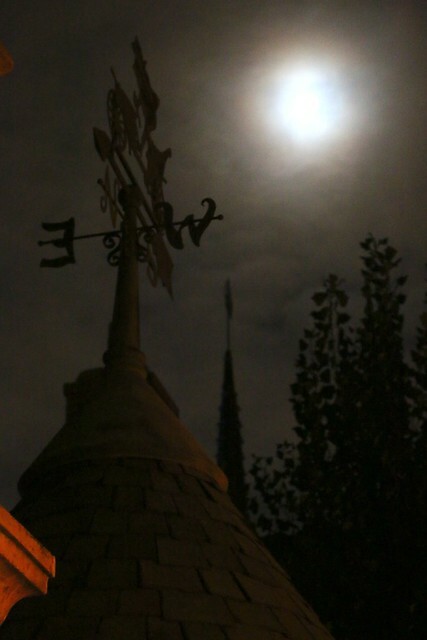 As the sun set, it was time to venture into Fantasyland. 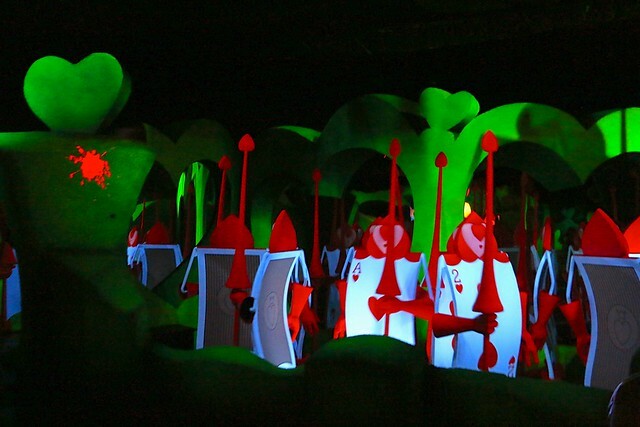 The newly updated Alice in Wonderland is a must see. 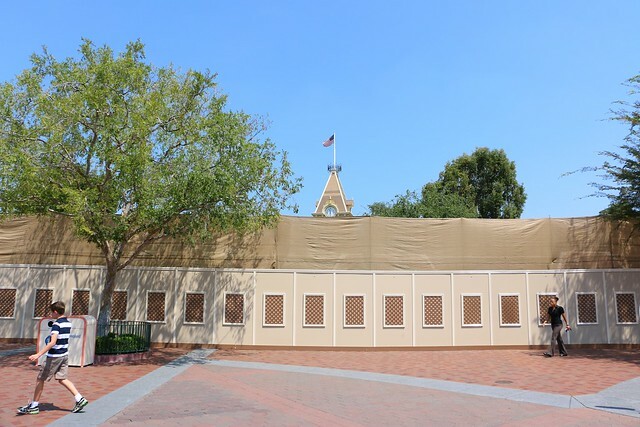 Outside, the area looks better than ever, especially after looking so ugly covered in tarps for so long. 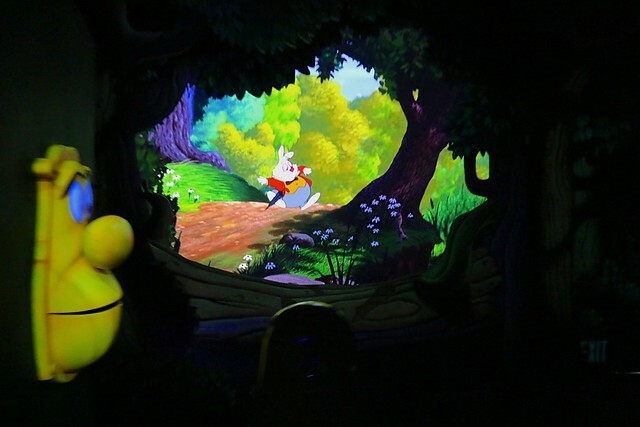 The White Rabbit hops along as we enter the ride. 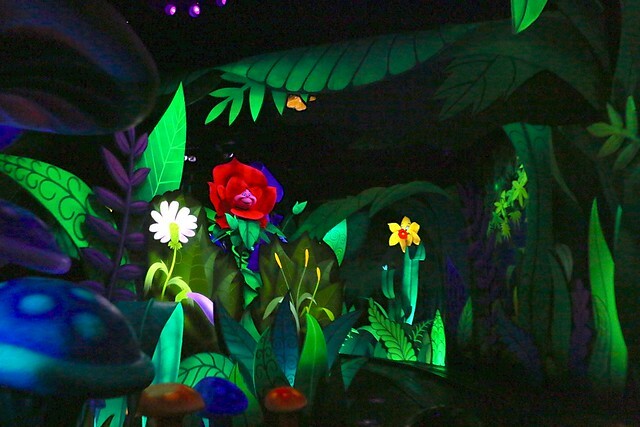 Flowers sing with more animation than ever. 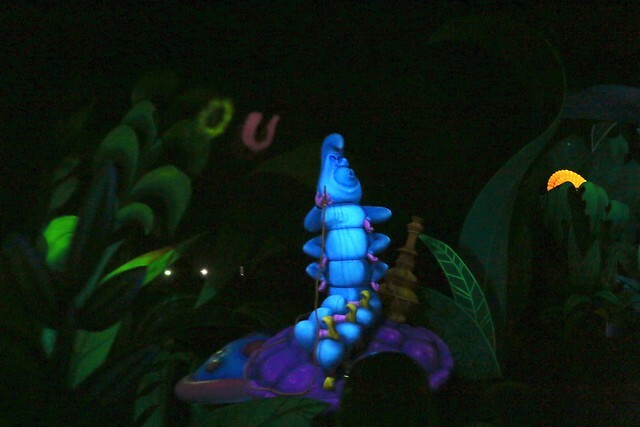 My favorite Alice character, the Caterpillar, now blows colorful smoke letters. 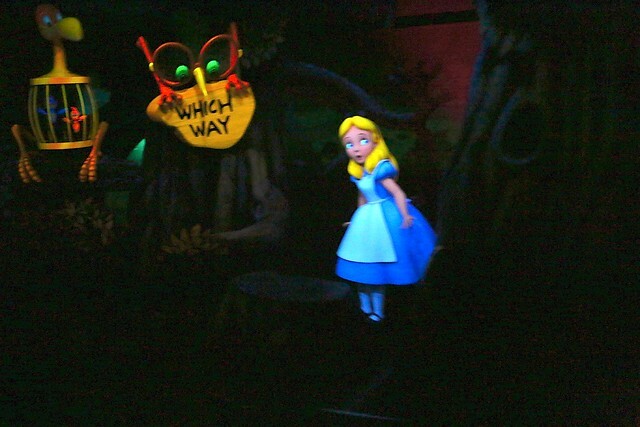 Alice has taken a much more prominent role in her ride. Splotches of paint appear as the cards paint the roses red. 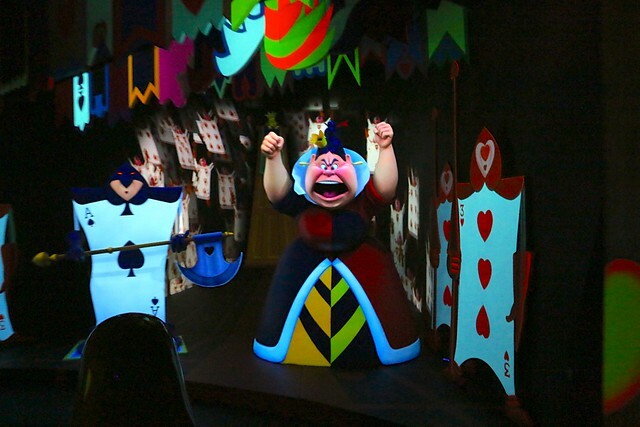 The Queen of Hearts’ fury is showcased through an endless projection of flying cards behind her. Two large animated cards help us outside. 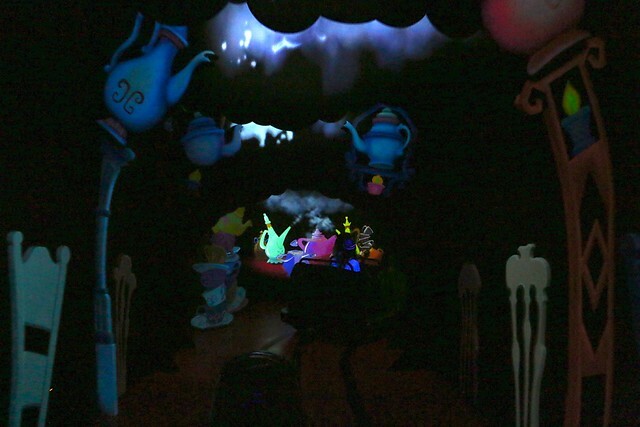 Back inside, the one disappointment in this update is that the crazy looking Cheshire Cat is gone from this moment, replaced by a tea party animation. 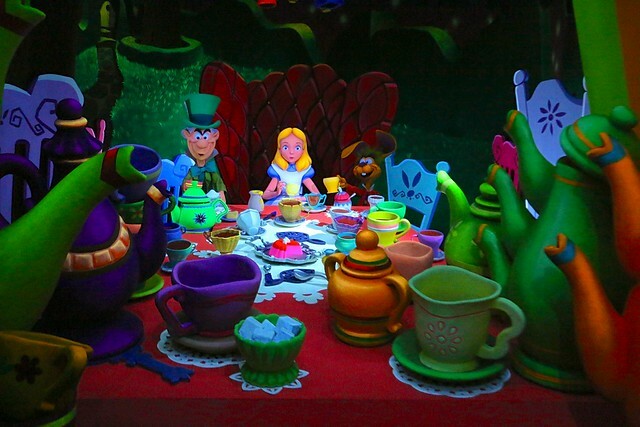 But the tea party itself looks beautiful, especially with Alice being part of it now. 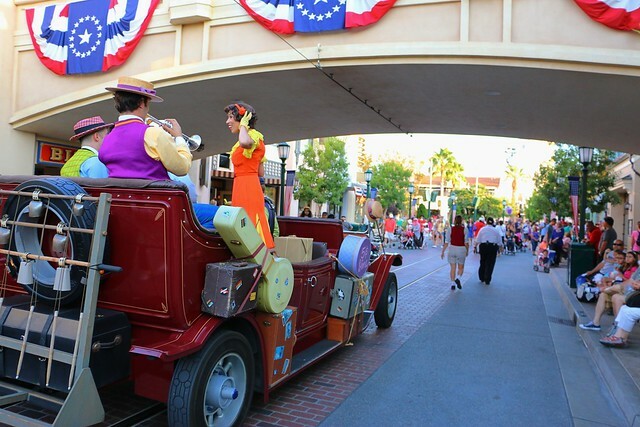 Much like beginning a day at Disneyland with a ride down Main Street, strolling into Disney California Adventure just as the Five and Dime act comes out is just perfect. 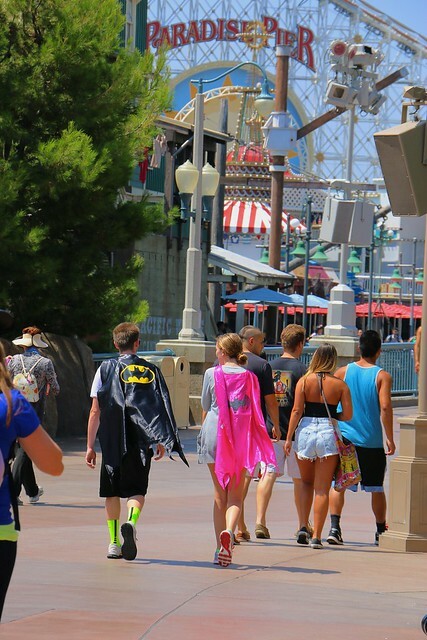 A couple of superheroes were spotted en route to Paradise Pier. 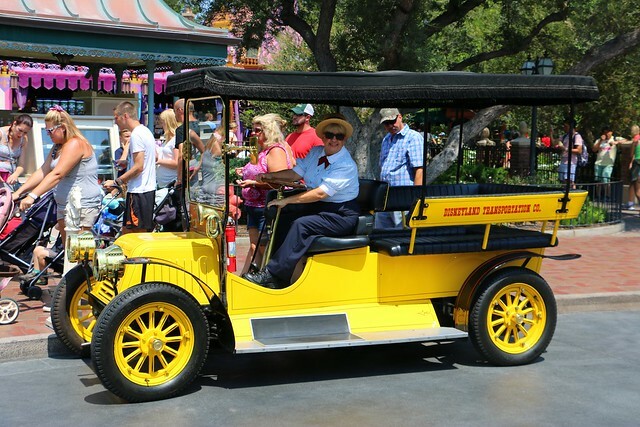 It seems Cars Land is finally old enough to allow smaller wait times. 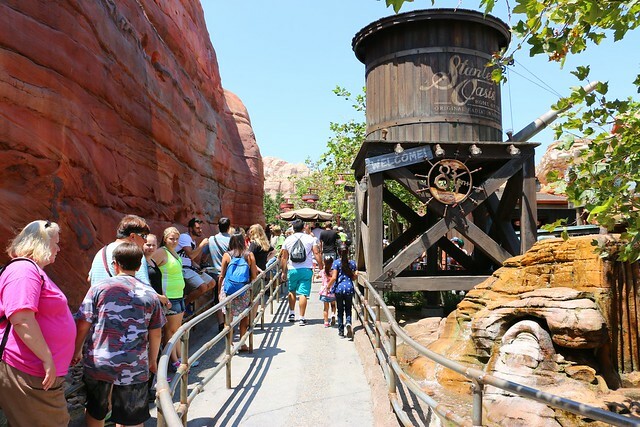 The single rider line for Radiator Springs Racers began here, taking just 10-15 minutes to hop aboard. And I won the race! 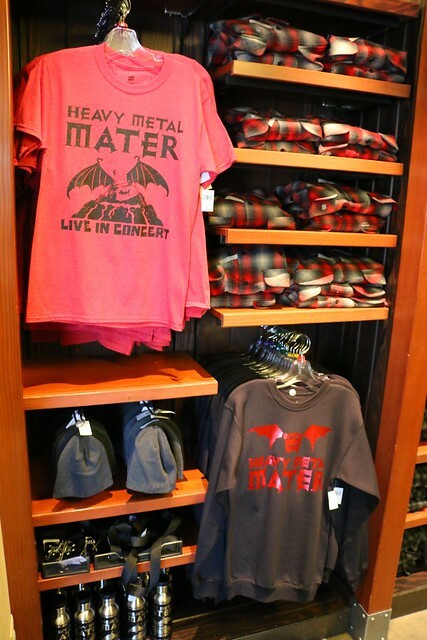 New (to me) Heavy Metal Mater shirts are pretty amusing. 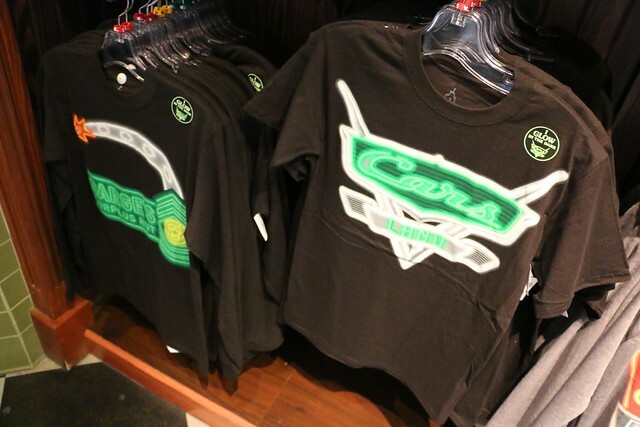 Glow-in-the-dark Cars Land shirts representing the area’s neon lights are also nifty. 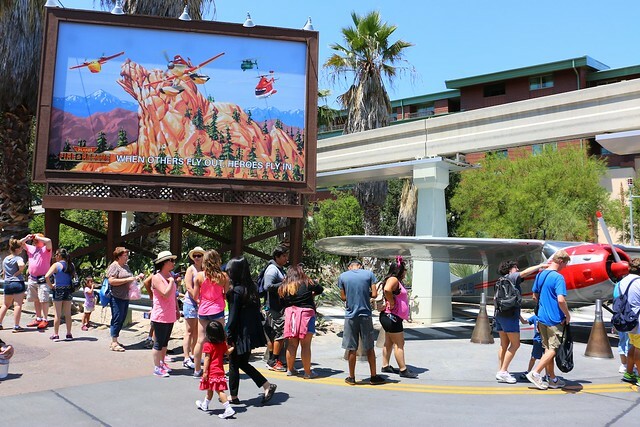 There isn’t much else new to see at DCA, though I am surprised Condor Flats hasn’t received any kind of a Planes overlay, other than this one billboard. 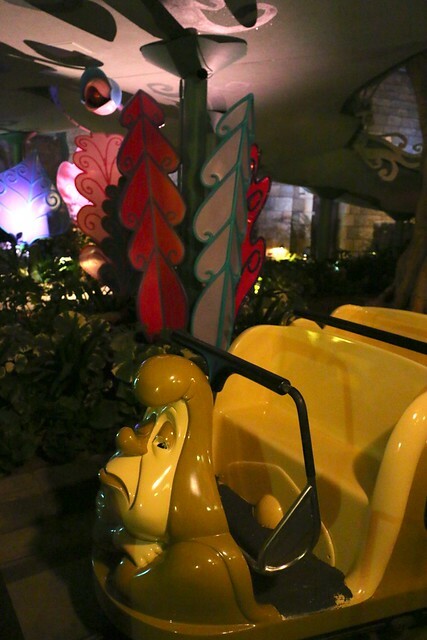 And that’s it for this edition of ParkSpotting at Disneyland! I do hope to bring more frequent ParkSpotting posts in the future. 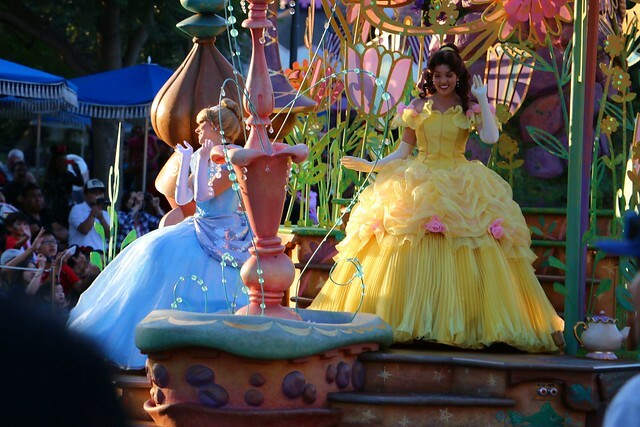 We’re off to a good start in 2014 with TWO posts now instead of just ONE like last year! Thanks for the pictorial update please keep them coming I love them. Thanks for the update. 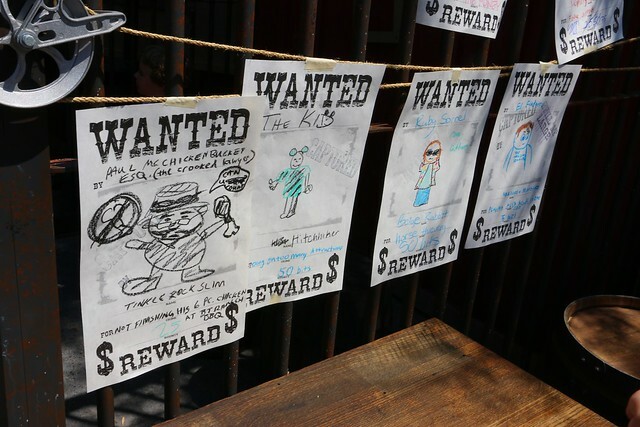 The Alice and Indiana Jones rides were closed when we traveled to Disneyland in April, so it’s nice to see them post-refurbishment. 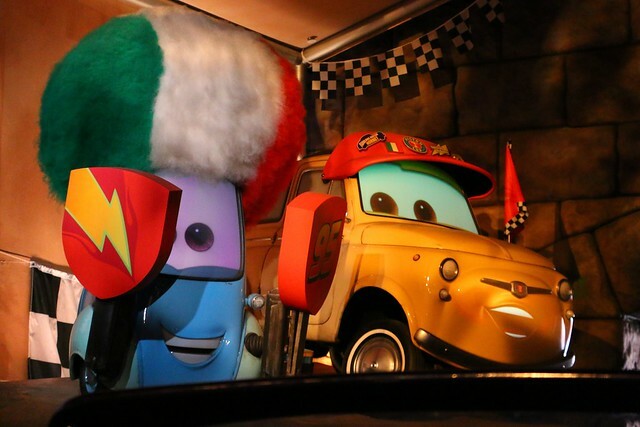 We LOVED Carsland, especially at night. I’ve been collecting captain america comics for years . hes one of my favorite comics. I really loved how the actor stayed in character going along the lines of the ending of the avengers movie. Love these updates. 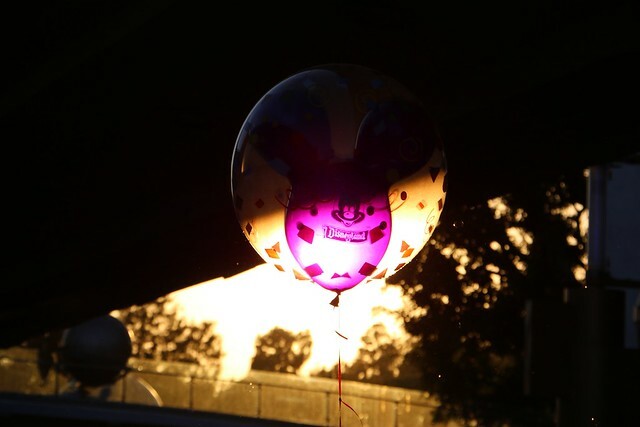 It’s almost like being back in the resort again. 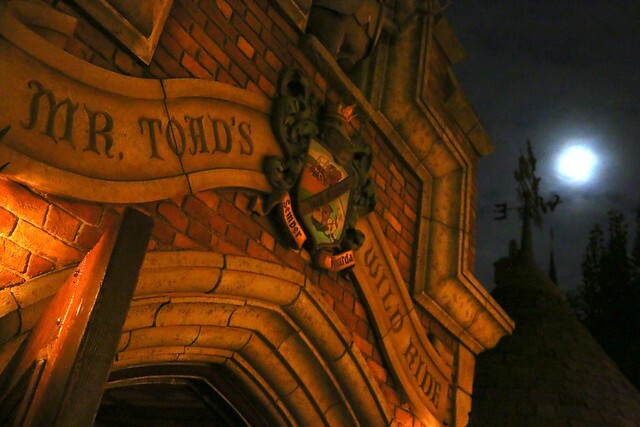 The recent refurbishments all look so amazing. 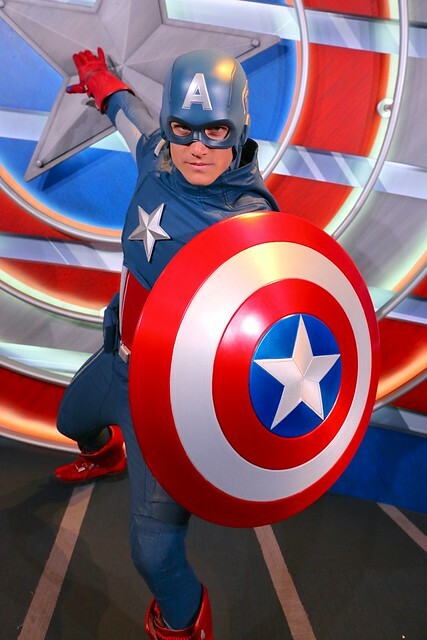 That Captain America was so handsome. I would have fainted. Thor was just okay. His face was off. 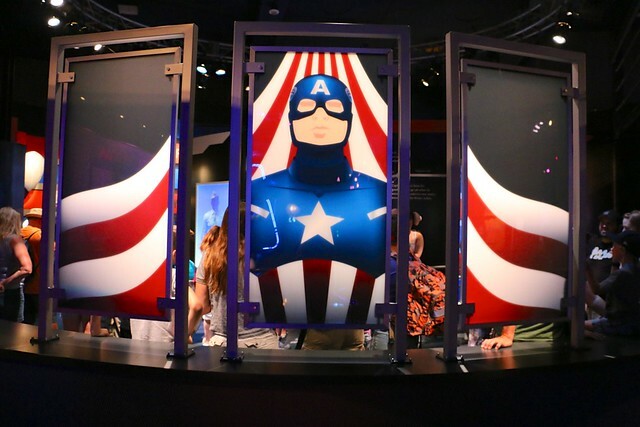 But the cheekbones on Cap went on for days and days. I would have asked him out on a date! 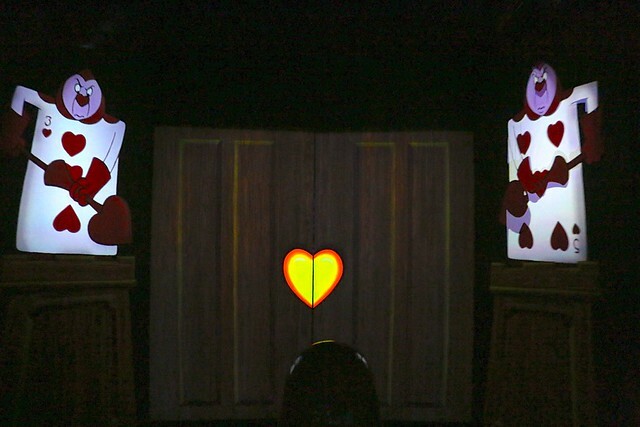 Honestly, the removal of the Cheshire cat head scene should not really be seen as a disappointment at all. I think that it is a huge improvement now. It is a much better transition and makes for a more cohesive finale.